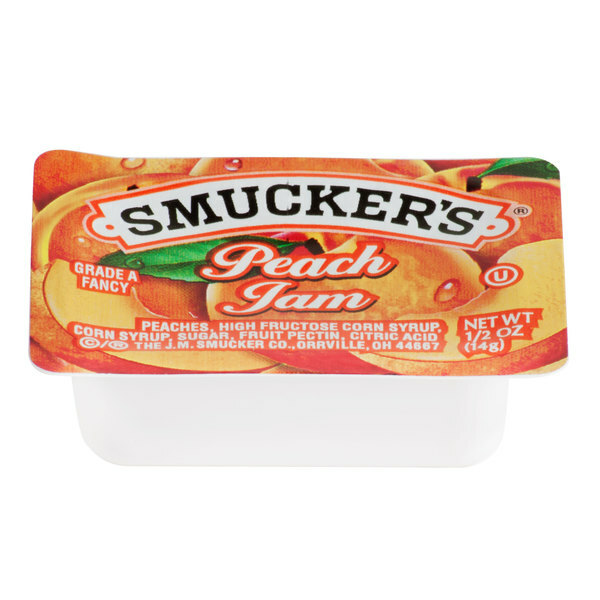 Just the right size for your patrons' dishes and packed with fresh flavor in each cup, you can't go wrong with Smucker's peach jam! The name Smucker's is highly recognized in just about any venue, and their premium selection of jams, jellies, and marmalades uphold a tradition of full-bodied flavor, great quality, and value. Try these plastic portion cups in your restaurant, diner, school cafeteria, or convenience store. Their .5 oz. 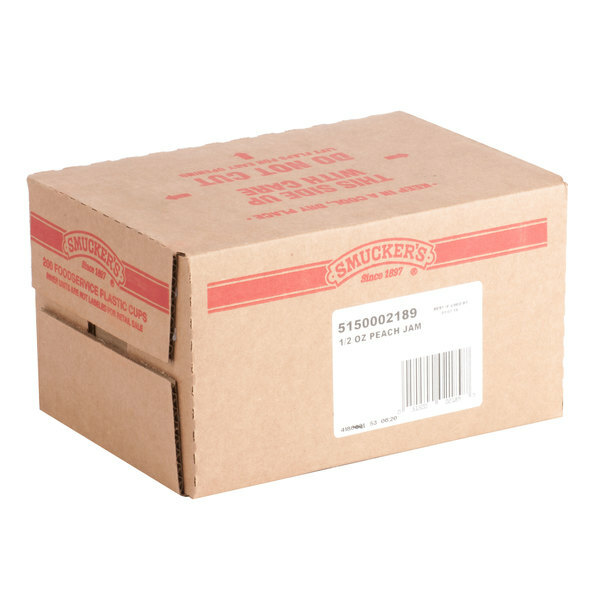 size is perfectly-portioned for a single serving, and your customers can even grab them on the go with their take-out meals. Peach jam offers a quick and easy way to enhance menu items with the delectably sweet and subtly tart taste of wholesome fruit! It's the perfect complement to toast, biscuits, bagels, pancakes, and waffles. Rather than buying jellies and jams in bulk jars, these portion cups are easy to serve in caddies on your tabletop or hotel breakfast bar. Bursting with summer-sweet flavor, the smooth texture and luscious taste of this peach jam will add just the right amount of satisfying sweetness to your customers' dishes. 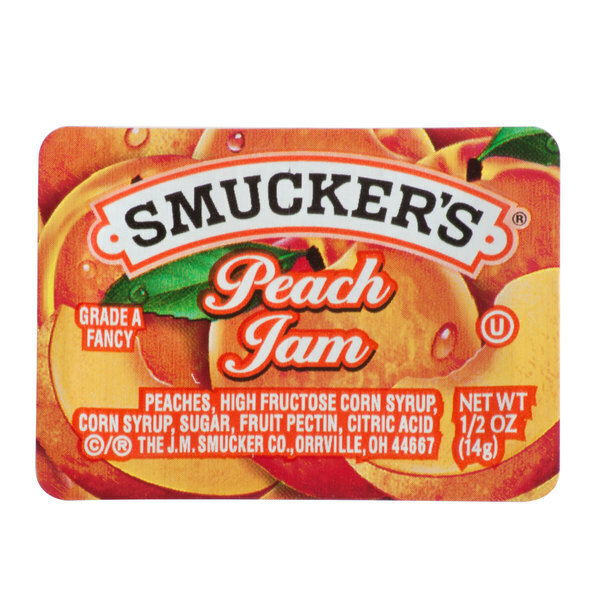 So happy to see peach as an option, and, adding the Smucker's name denotes quality. Love the taste and the texture of this product. Perfect on a slice of toast or an English muffin or even to spread on pancakes. I would highly recommend this product. 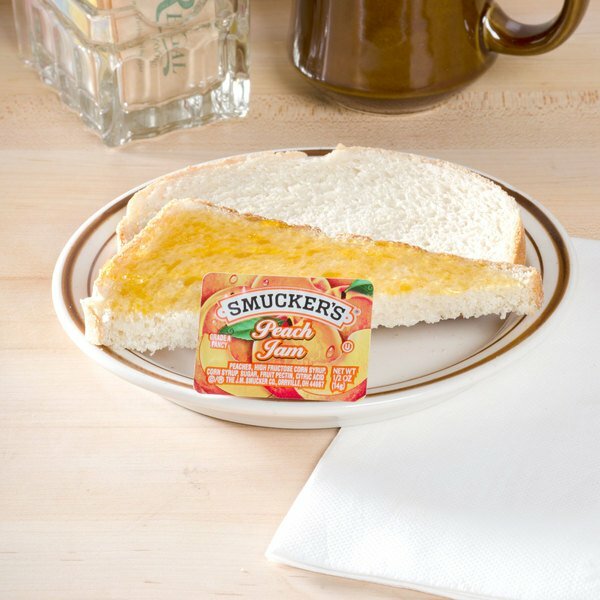 We place these on each table for guest to enjoy on their toast, English muffins and bagels. I like the flavor and the portion size. Very happy to have stumbled across the peach jam in the portion cups. Very hard to find and this brand is the best. A great peach flavored jam and great on bagels. The Smucker's peach jam is so fresh tasting with a great natural coloring. The portion cups are easy to display on our condiment bar and are a great price. A nice find. A yummy peach jam that is bursting with the great taste of fresh peaches. The jam is awesome on toast and is the perfect consistency for easy spreading. This jam is pretty good and it does infact taste like peaches. Very easy to open these little containers, and perfect for toast or bagels. This one does taste likes peaches and not chemicals or whatever. It is good on toast but especially good when spread on warm sweet desserts.